During Robert Harkness’ 1909 tour of Australia the young Bendigonian, now aged 29, met and fell in love with Adela Ruth Langsford, the daughter of a well known Adelaide businessman. The attraction was obviously mutual because within the six days of Robert’s stay in Adelaide they quietly agreed to marry as soon as he returned from his current tour. Ruth had a beautiful contralto voice and Christian music was to play a central role in their lives together. 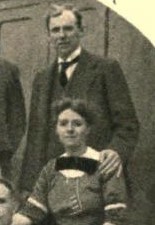 But they were not able to wed until Robert returned to Adelaide ahead of the main mission team early in 1912. So, on Friday, 16th February, 1912, Robert and Ruth were quietly married in Adelaide by the bride’s uncle, a Methodist clergyman. Unfortunately the couple never had any children so we are left to wonder what an offspring of the world’s leading Christian gospel music genius and his top level contralto wife would have produced. 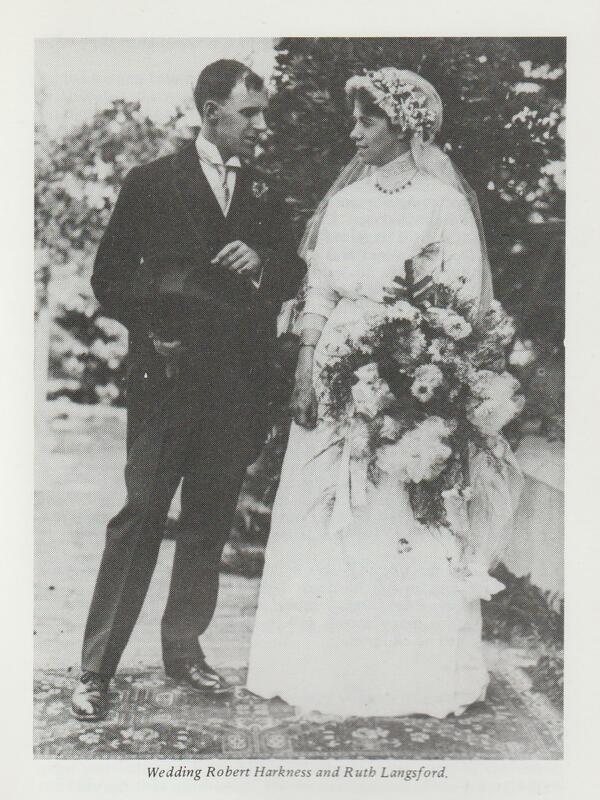 The photo above was taken on Robert and Ruth’s wedding day in 1912 in Adelaide. Newly-married Robert and Ruth as part of a mission group photo, 1912. Meanwhile Ruth entered into the work of the mission and often sang solos with her accompanist husband to the glory of God. When the mission came to Geelong early in 1913 it was realised that a large tent would have to be erected in centrally-located Johnstone Park to accommodate the expected large crowds because no other building in the city was large enough. Calculated to safely hold around 2000 people the marquee was erected on Friday 24th January. Seating was provided by the combined Churches and all was in readiness for the opening meeting on Wednesday, 29th, but a severe gale tore a rip about 20 metres long in the canvas. Other storm damage, not untypical of Geelong in summer, accompanied the strong winds and the meetings had to be held in His Majesty’s Theatre until the repairs took place. By Saturday, 1st Feb, the great tent was ready once again and the third meeting took place there. The “Geelong Advertiser” reported there were well over 3000 present in Johnstone Park, which meant many hundreds could not get access and had to listen outside. During the meeting Alexander invited Ruth to sing the chorus of “He Died of a Broken Heart For You.” The Geelong Advertiser reported “The soloist has a wonderfully impressive contralto voice, and as she sang the choir leader [Alexander] stood as a statue watching the effect on the crowd. “Sing it again, Mrs Harkness; they’re all interested,” he called out. NEXT ISSUE: Robert and Ruth move on.